Deb Fallows: Learn a new Chinese word! Learn a new Chinese word! Michael Meyer, author of the wonderful The Last Days of Old Beijing, wrote a fun short piece in the New York Times on the character for the word zhang, which was voted "Character of the year 2010" by Chinese netizens. Meyer defined the word as "rapid price increase", and my immediate reaction was: Another word I don't really know! So I went through the familiar motions of trying to sort out all the steps of learning a new word in Mandarin. This is no simple task, compared to my days of learning French, where all you had to do was go to the Larousse French-English Dictionary and look it up. Oh no, it's much more complicated in Chinese. First I dug into my favorite dictionary, Tuttle Learner's Chinese-English Dictionary. Since there was no tone mark in the NYT version of zhang, I had to search through all the entries for zhang, which included zhang with high tone, falling-rising tone, and falling tone. I knew the first zhāng, which was the measure word for flat things, like a piece of paper or a bed. And of course I recognized Zhāng as a common family name; I knew lots of Zhāngs! I also recognized zhǎng as a verb meaning "to become", as in "Your daughter has really become a beauty!" Another entry of zhǎng was defined as "rise, go up", which looked possible but pretty general. And zhàng as part of zhàngfu, which is one of the words for husband. Since I didn't see anything that came close to the quite specific "rapid price increase", I headed for one of my favorite websites, Chinese-tools.com, which has lots of ways to explore Chinese words. I tried keying in "zhang", but got so many results that I got lost and confused. I tried English "price rise" and "price increase" and everything else that came close, but kept getting "sorry, no matching entries....". Keying in "inflation" returned a long 4-character phrase. Next I tried my more sophisticated Reading and Writing Chinese, by William McNaughton, for looking up great explanations of characters. There were lots of entries, and sifting through them all, I found one that looked promising. Zhǎng, with a falling-rising tone, meaning "rise, a river; a price". 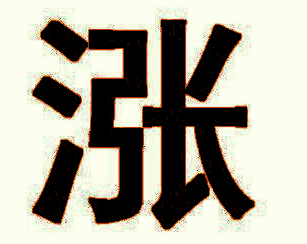 It was illustrated by the character above, as was an entry of zhàng with a falling tone, meaning "to swell, to rise". I usually find it helpful to cross-check resources, especially with such confusing words, so I headed to Google and keyed in "China 2010 character of year zhang". Almost bingo! I found some articles from Chinese press that defined the word as "price rises", "inflation" and "rapid price rise". This got me closer to a real grip on the word, but no confirmation of tone marking. Then I clicked on "images" in the Google results and multiple images of the character pictured above, and bonus information that 2993 netizens had cast their vote for it as the 2010 character of the year. Finally, seeing the character and definition together, being able to look up the different parts of the character and starting some dictionary searches over again, and a pretty good idea of the tone marker, I felt I was getting some traction with this word. Mostly, this has been a reminder of what an arduous and humbling exercise it becomes to learn new words in Chinese, particularly when you're out of the country and getting little real-life context for the word at hand. I use the mdbg chinese english dictionary online. A search for zhang returns as the fifth result zhang (3rd tone) "to rise (of prices, rivers)." zhang (to swell/distend); zhangdie (rise or fall in price); shangzhang (to rise/go up); zhangfu (rise and fall of stock in one trading day); and many others. Are you familiar with the software program Wenlin? Essentially it's a flexible Chinese-English/English-Chinese dictionary. Once you have played around with it for a while it makes it very easy to look up new characters. I simply typed in "zhang" and, as with the commenter above, immediately found the character you were looking for, with essentially the same definition as noted above. I find Wenlin indispensable for learning and studying Chinese, even after 15 years at it. If you had the Chinese dictionary and study program Pleco on an iPhone or iPod touch, then could have simply written the character in handwriting on the screen and looked up the character as well. Very powerful and useful. (On an iPhone you can also simply point the camera at the character and it will look it up for you). I love Pleco and it is the best hand-held Chinese dictionary, but I prefer Wenlin for working with longer documents. Googling Pleco will turn it up very quickly. Enjoyed your book, by the way. MDBG and Pleco are both excellent. I would also suggest nciku.com as an option for writing the character. You do things the long way around. ;-) Learning Chinese ten years ago would have been much more challenging. And now there's the Google Translate app for Android and iPhone. Though it's had some trouble parsing phrases based on my limited testing. Keep sharing such a useful post. Thanks for sharing your interesting blog of content. This SEO Training Classes demonstrates you Everything you have to remain on the main edge of advanced showcasing and utilize imaginative apparatuses to get genuine business comes about. Care about mastering Search Engine Optimization (SEO) in 2017. Join upcoming SEO Certification Course Workshop in Chennai & Join Free Demo.